An Audio CD is a compact disc which contains high quality audio tracks. It can be played in standard Audio CD players, car cd players, dvd players, and computer optical drives. M4A file means MPEG-4 format audio file. It is similar with .mp4 file, but only contains audio data. Usually, the audio data in m4a file is encoded with AAC compression. Compare with mp3 file, m4a file has better sound quality and smaller file size. 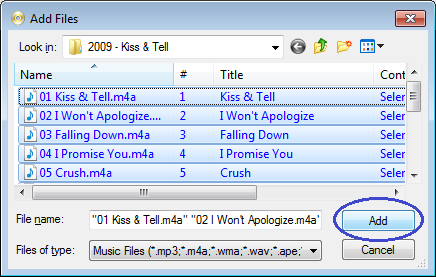 With PowerISO, you can create Audio CD from m4a files. Please follow the steps to burn m4a files to Audio CD. Run PowerISO, and select "File > New > Audio CD" Menu. You can also click "New" button on toolbar, then select "Audio CD" from the popup menu. PowerISO will create an empty Audio CD project. You can then add m4a files to the project. Click "Add" button on toolbar. 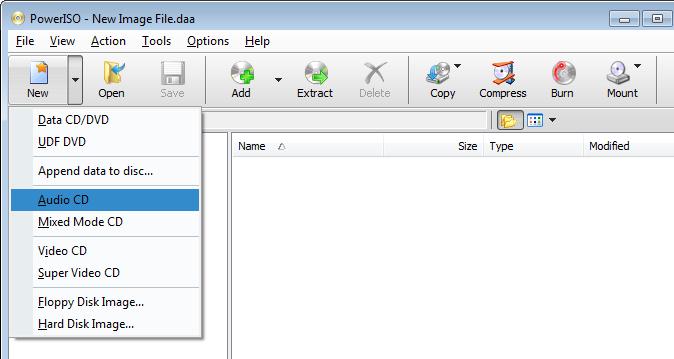 The "Add files" dialog will popup. Select the m4a files you want to add to the project, then click "Add". You can select multiple m4a files at once. The selected m4a files will be checked and added to current project. Repeat this step to add all needed files to the project. Please make sure that the added m4a files will not exceed the compact disc capacity. You can also remove the file from the project by selecting it in the list, then click "Delete" button on toolbar. 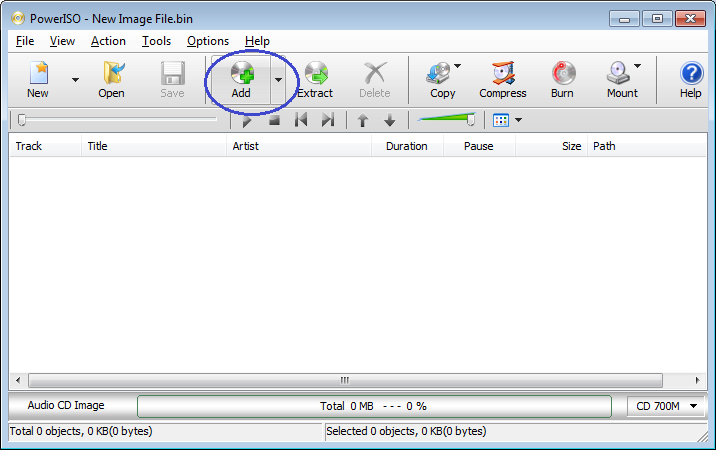 Insert an empty CD-R or CD-RW disc in the writer, then click "Burn" button on toolbar. The "Burn" dialog will popup. 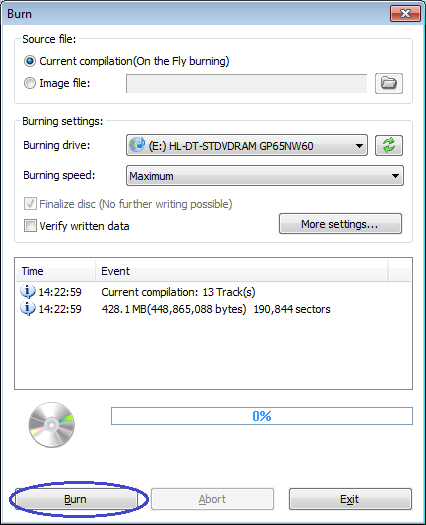 Select the correct burn drive from the list, and change other settings if necessary. The default burning speed is the maximum speed allowed by the writer and the media. You can select a slower burning speed at your will. 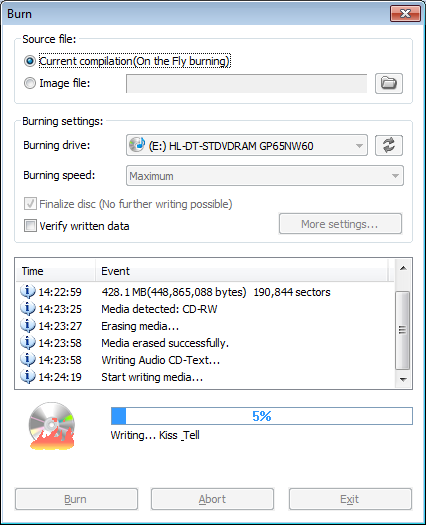 Click "Burn" to start burning m4a files to the disc. PowerISO will start writing m4a files to the disc. You can see the detailed progress information during writing. If there is CD-Text information in the m4a files, it will also be written to the disc. If the operation completes successfully, you can see the message, "Burning completed successfully". Click "Close" button to close the message box. If you want to burn another copy, please insert a new writable CD, then click "Burn another copy". Copyright 2004-2019 Power Software Ltd. All rights reserved.